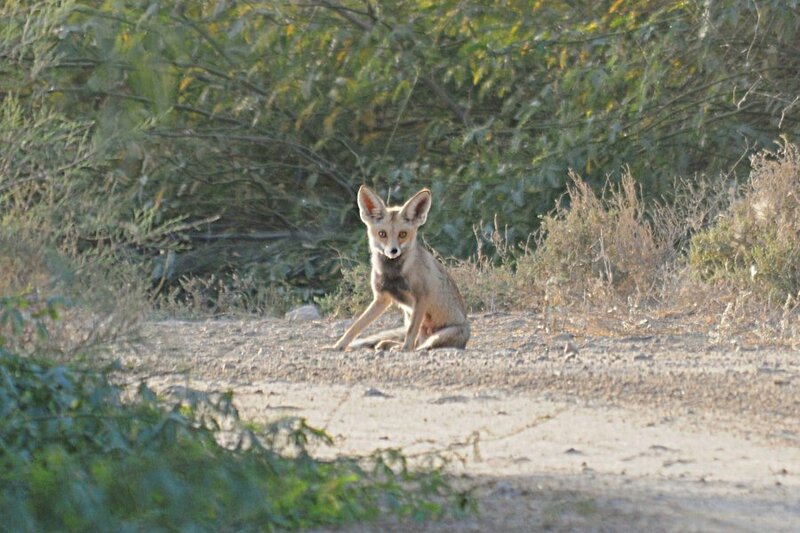 Whilst out birding the area near the Percolation Pond I saw an Arabian Red Fox sitting on the track passing the pond. I have seen foxes in this same place on quite a few occasions during the year and the animals are becoming a bit more used to me, although still do not let me come too close. The Fox saw me as you can see from the photo and spent a few minutes looking to see what I was going to do and eventually moved off when a dog walker came into view. Last spring I saw the foxes going in and out of a den, but this year I have just see the foxes on a few occasions. One day, hopefully, I will be able to get a really good photo of the foxes but until then this one will have to do. They look very different from our Red Fox but are the same species, different sub-species. Large ears, fur on feet, small size etc all adaptations to living in harsh conditions of extreme heat.